Will do that the next time. 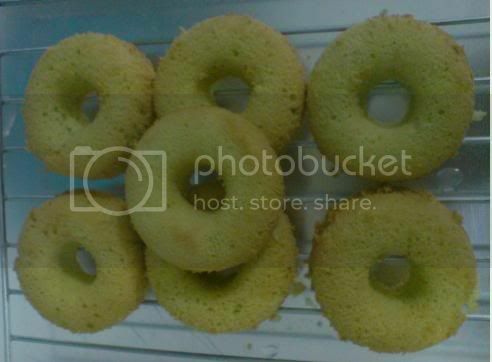 Baked this yesterday and turn out to have great spongy and light texture. However, the pandan taste was not strong enough, perhaps its becoz I used frozen pandan leaves. Will prob add in some pandan essence next time! My friends all liked it though, thanks! Don't use pandan esscence. artificial tasting. I am also not in favour of pandan essence. I find it very artificial as well. Perhaps you could use more frozen pandan leaves next time. Hi, I have tried this recipe and it yielded really good pandan cake. However, I find that it tends to turn sourish on the second day. Is that the norm? And there will be damp parts. I'm not sure wat it is due to. The weather? It has been raining much reently. Is it because of the humidity? my mini adventure with my 1st chiffon cake... bought the cake tins which are about 4" wide because my oven is rather small... not quite the texture I expected.. I think it was because of the egg white.. but the taste was great.. will try out again to get the texture right..
will anyone happen to know if i halve this recipe, will the chiffon still rise?? Can anyone share some tips please?? Would like to ask if using plain all-purpose flour instead of cake flour make the chiffon cake fail? Thanks! Not sure whether it will fail but it will certainly be denser than using cake flour. All-purpose flour has higher protein than cake flour so more gluten will be formed. Sorry to interrupt .... I baked this cake yesterday using all purposes flour. The cake turned out well. im suspicious if it's to do with my baking tin... i realise everyone's using those shaped with a whole in the middle... is it absolutely necessary to use that??? just sharing here..I learnt Chiffon cake baking from Chef Kim See who teaches at Mayer Marketing for customers who buys KitchenAid mixer and their range of Ariston ovens. She says to bake a good chiffon cake, you need to beat the egg whites properly and to be gentle in the mixing of egg whites and the rest of the batter. Never over stir, or beat to mix the 2.
also, the temperature in the oven must be just right. 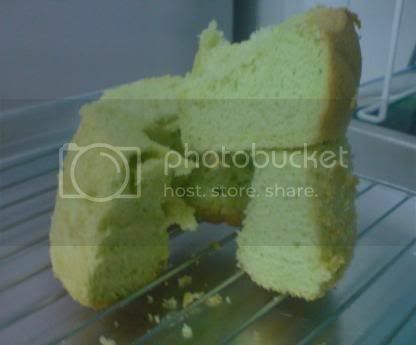 much care is needed to understand how chiffon cakes work. The whole process from preparation to baking to waiting may take 2 hours. i got an qns, how do make the pandan juice. as i dun have a blender at home. Pound the pandan leaves until pulp & squeeze juice out. 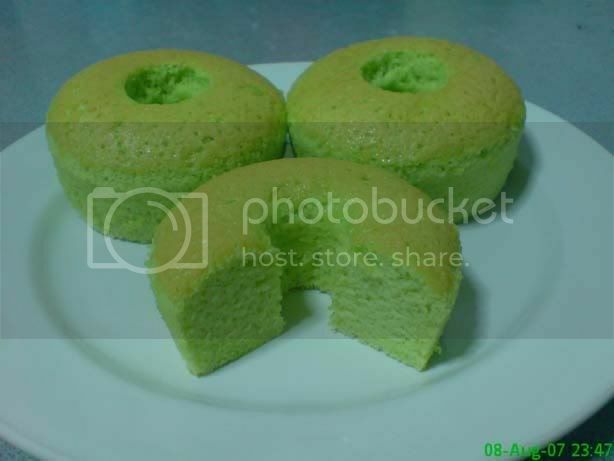 sorry, from the last post till now was quite some time already.. i wanted to bake pandan chiffon cake and found this.. in your recipe, you put 4 Large Eggs (whites & yolks). Do u mean I must really get those large eggs or I can replace it with ordinary egg, if so, how many is equivalent to your 4 large eggs? sorry if i sounded very silly.. first time trying to bake this, so better to be well prepared..
wow. i want to try this recipe without coconut milk. does it taste good? how much water to add to get the juice? and how much pandan leaves will be enough? If you want very strong pandan flavour, then you just put a little water & blend with more pandan leaves until you get 115ml. It all depends on how strong you want the pandan smell. I just made this cake over the weekend and I used about 15 frozen pandan leaves and added about 100ml of water. However, my blender was not so effective in blending so added like another 40-50ml of water. Then added about 1 tsp of pandan paste to compensate for the lack of pandan flavour. I have made this cake with and without coconut milk and I personally prefer to have coconut milk in it. But I think not having fresh pandan leaves, the coconut milk brings out the pandan flaour more. Maybe you can try both and see which one you prefer.